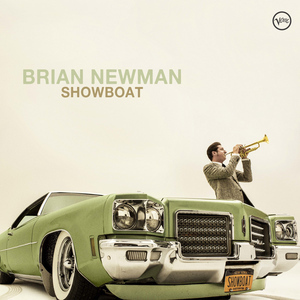 LISTEN TO LADY GAGA/BRIAN NEWMAN'S "DON'T LET ME BE MISUNDERSTOOD"
SHOWBOAT brilliantly captures the convivial style and eclectic repertoire – which Brian refers to as a "fully immersive jazz meets rock ‘n' roll experience" - that he has mastered in his live performances. Brian has made a name for himself as a consummate entertainer on the NYC club circuit in recent years with extended engagements at The Oak Room, Birdland, The McKittrick Hotel and The Rose Bar. In 2016, he toured in major cities across the U.S., some of which were highlighted by surprise "drop-in" performances by his close friend and musical colleague Lady Gaga. Brian was featured on "Watch What Happens Live with Andy Cohen" last night and the launch of the album was celebrated at the Classic Car Club in NYC. Tom Wait's "Jockey Full of Bourbon" as well as "San Pedro," which Brian penned himself, and "Tropicalia" (recorded by Beck for his 1998 album MUTATIONS) the first single to be released. The album was produced by Dae Bennett (Tony Bennett's son and record producer) and features the Brian Newman Quintet with Steve Kortya (Saxophone, Flute), Alex Smith (Piano, Keyboards), Joe Peri (Drums), Daniel Foose (Bass), and Paul Francis (Drums, Percussion). Hailing from Cleveland, Brian played trumpet for his local high school jazz band but also honed his musical influences which included Miles Davis, Chet Baker along with Nirvana and Thin Lizzy. He attended the Cincinnati College-Conservatory of Music but decided to end his formal training and move to New York City in 2003. During that time, he hustled for club gigs, recorded on hip-hop sessions and tended bar. Brian's exposure expanded and he landed a regular gig at Plaza Hotel's famed Oak Room where Stefani Germanotta first heard him perform. Their friendship led to Brian's involvement in the CHEEK TO CHEEK project and the global world tour. His engaging stage persona, musical chops, suave suits and jazz/rock communion has created a unique sound and sensibility that rocks the showboat.